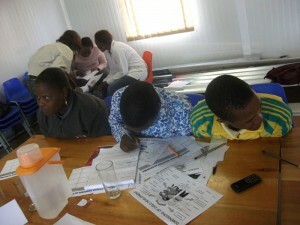 Training on Child Development and Working with Vulnerable Children at St Kizito, QwaQwa. January 2012. Community carers from St Kizito Children’s Programme in QwaQwa, diocese of Bethlehem, attended a 2 day training workshop conducted by Avie Cherrington, SACBC AIDS Office OVC Project Officer. The training is aimed at assisting community carers to understand healthy child development and how to work with children holistically, thereby identifying vulnerability or problems in the child’s individual development or environment. Participants have to put all the new knowledge gained at the workshop into action by working in small groups to come up with a psycho-social activity that develops the child holistically and builds self-esteem. 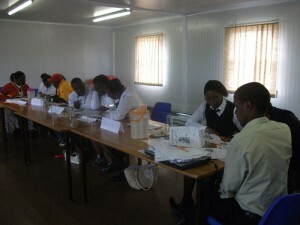 In the group are, standing from left: Dineo, Ntisa, Thabo, Avie, Ntapane, Sara and Elsie. Sitting in front, from left: Johannes (project co-ordinator), Tumelo (OVC co-ordinator), Mmetseleng (secretary of the Board), Sechaba (finance and admin officer).